From Fifth Dimension (Columbia, 1966) via Reelin’ in the Years. 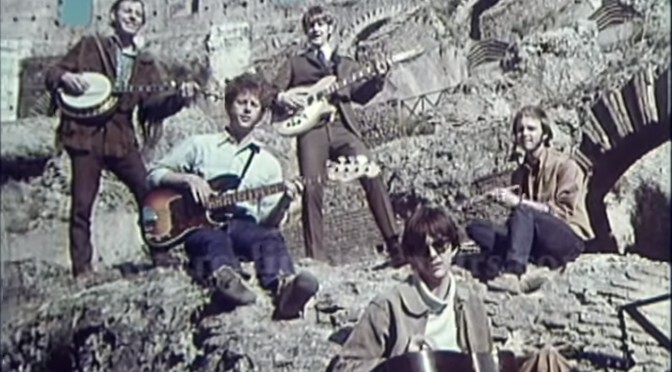 Filmed at the Roman Colosseum while the Byrds were in town to play the first International European Pop Festival in 1968, two full years after “Mr. Spaceman” was originally recorded by a very different Byrds lineup. In the video, we see original Byrds Roger McGuinn and Chris Hillman joined by newbies Gram Parsons, Kevin Kelley, and Douglas Dillard. (See below for audio of that lineup performing live at the Piper Club.) From Rome, the Byrds would travel to England where they met and hung out with the Rolling Stones before heading back to the States. This was May, and they’d be back in England again in July before heading down to South Africa. Except that Gram Parsons stayed in England with the Stones. My guess is that this is a gross oversimplification and that the truth is more complex. Nevertheless, after less than four months in the band, Gram was out. But it’s pretty cool to see this footage from his brief time as a Byrd. The Byrds: twitter, amazon, apple, spotify, wiki. Live at the first International European Pop Festival, May 7, 1968. Piper Club, Rome, Italy. 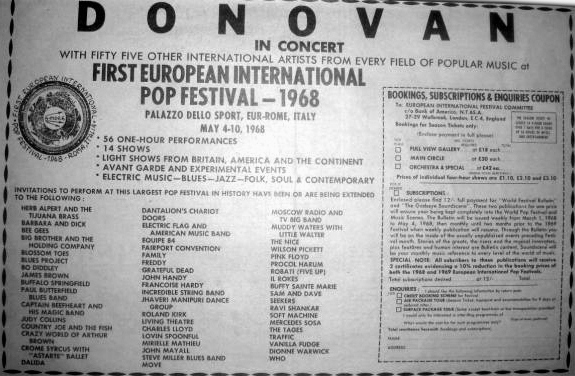 The International European Pop Festival had advertised the inclusion of the Grateful Dead, the Doors, the Who, Muddy Waters, and about 50 more bands, but most of the big names pulled out. It ended up being a four day festival with Pink Floyd, Captain Beefhart, Donovan, the Byrds, Traffic, and several other bands. 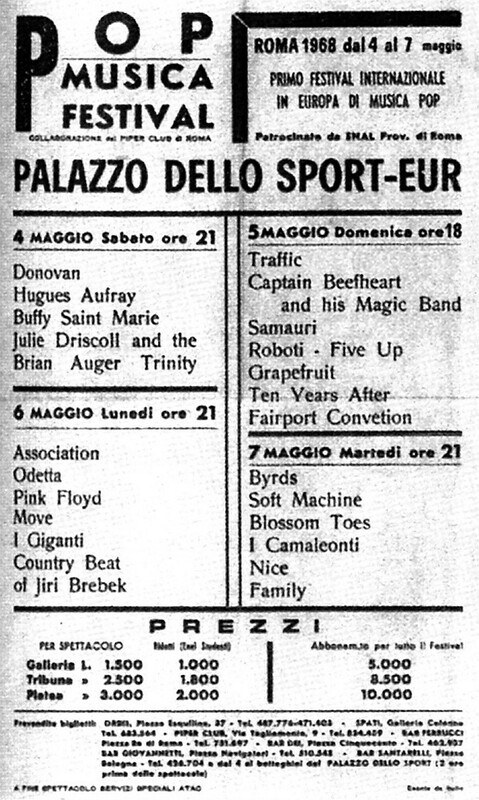 After the Move apparently set off some pyrotechnics on the third day, the fest got moved from the ~20,000 capacity Palazzo dello Sport to a much smaller venue called the Piper Club for the final day. By all accounts, the entire event was terribly organized and poorly attended. A documentary was filmed for the BBC but never aired. The original ad claimed that dozens of bands had been “invited to perform” without mentioning that few had accepted the invitation. By the time the festival programs were printed, the scheduled performers had been whittled down but in retrospect it’s still a pretty damn impressive lineup! Via Rolling Stone #12, June 22, 1968. Previous PostNew Father John Misty video: Mr. TillmanNext PostSounds Like. . . ?